Anyone reasonably well versed in medieval history should be able to produce a list of some illustrious (and sometimes ignominious) members of the Knights Templar Order. Sure enough, in popular culture (books, movies, video games) these men are often ascribed deeds and character traits that probably had nothing to do with reality, but they remain actual historic figures no matter what. However, these historic Knights Templar are often outdone is bravery, wisdom and mischief by the Templars who never existed. It is time these characters are cataloged, lest someone assumes them to be real medieval warrior monks. Arn Magnusson is a Swedish Templar featured in the series of novels by Jan Guilou. Movie adaptations of these novels (2007 and 2008) faithfully depict Guilou’s story of Arn who has since become perhaps the most beloved fictional Templar ever. Brother John Mark (Jean-Marc) Larmenius of Jerusalem was the supposed author of the document currently known as the Larmenius Charter. The provenance of this document is extremely uncertain and its authenticity is doubted even by the masonic and neo-Templar organizations that use it as a part of their lineage claims. The charter insists that Jacques de Molay made Larmenius his secret successor as the leader of the Order. Thus the Knights Templar managed to survive the persecutions and the undercover Order has been in existence ever since. Some people today believe that even though Larmenius himself never existed, the document hints at what really happened to the Order of the Knights Templar. Brian de Bois-Guilbert is one of the main characters in Walter Scott’s novel Ivanhoe. Brian is a villain, driven by greed and lust. It can be argued that Walter Scott’s portrayal of this Templar commander has been influenced by the grim and grotesque legends about the Knights Templar which used to be especially popular in Northern France. In the 2011 film Ironclad, Thomas Marshall is a Templar Knight who joins the struggle of some English nobles against King John. This heroic and somewhat troubled character is very loosely based on William Marshall 2nd Earl of Pembroke whose family had close ties with the Knights Templar. In Raymond Khoury’s novel The Last Templar, Martin of Carmaux is a young knight who is charged with the task of protecting the greatest secret of the Order. It may seem that this list is short. Please suggest any names that are worthy of being included here. At the time of writing, the biggest hope for any Templar fan is that the new History Channel production Knightfall will create some very memorable characters. How can one become a Knight Templar? On March 23, 2015 History Channel made an announcement that a new scripted TV series is now in production. It will feature the final years of the Order of the Knights Templar and will be produced by A+E Studios in association with Jeremy Renner and Don Handfield’s The Combine and Midnight Radio. The details are very sketchy at the moment. It suffices to say that industry sites covering this story indicated that the series will feature “the actual events leading up to and following the persecution, downfall and burning at the stake of the Knights Templar on Friday the 13th, 1307.” Given the fact that not a single Knight Templar was actually burned a the stake on Friday the 13th, 1307 the series is probably still being perfected. It also appears that the title of the series, Knightfall, is very much a working title, particularly because there is Batman story arc with the same name. One may also remember that some time ago another Templar-related series was announced by History. This one had to do with the fate of two brothers who came to Jerusalem in the aftermath (or during) the First Crusade. There is no word if this series is still in the works. However, today’s announcement demonstrates that the network is somewhat committed to the Templar theme. Perhaps in a couple of years we will see something on the scale of the Vikings? What’s the absolute best thing about watching a movie that is known to be a veritable train-wreck? That it delivers! Should I issue a spoiler alert? Perhaps, but the movie’s trailer is even more revealing. “Night of the Templar,” directed by Paul Sampson, was meant to capitalize on the never ceasing popularity of the Knights Templar while using a rather typical horror movie plot structure. Actual historic references are weak and obscure. The back story of the film involves a group of Templars who are trying to figure out what’s next for them after their Order had fallen out of favor. The choices made by these soldiers unexpectedly come into play when a motley crew of visitors arrives at a somewhat luxurious contemporary manor for a “fantasy weekend.” Their adventure quickly turns into a blood bath when someone wearing full Templar armor unleashes his wrath on the guests. Curiously enough, Agatha Christie could have made this plot work perfectly, but an opportunity for a decent whodunit is wasted in favor of an unimaginative metempsychosis explanation of what takes place on the grounds of the estate. Early on in the movie, it becomes evident that the man charged with organizing the “fantasy weekend” is none other than the reincarnated Templar commander featured in the back story. As a result, the plot suffers a terrible blow, because there is simply not a twist in existence that could make us believe that this character is not responsible for the bloodshed. The viewer is simply forced to wait for the rest of the puzzle pieces to fall into place. The only surprise at the end comes in form of a completely misused principle of comic relief. In fact, if you end up liking the movie even in the slightest degree, the last ten minutes will take care of that. One truly unexpected thing is that the movie could possibly contain some clues about the death of David Carradine (I will omit the details not meant for PG audiences). Does that make it worth watching? Probably not. Now that I got Netflix, the plan is to become familiar with the various cinematic depictions of the Knights Templar Order. I am compiling my little list now. Surely, this list will be revisited, as more movies come to my attention. Da Vinci Code. I have to include this one. Code of the Templars (2004). A German flick, apparently not the best. 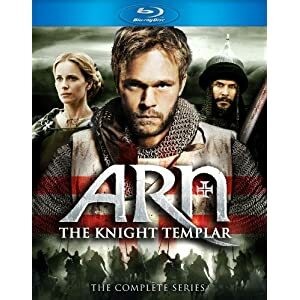 Arn – Tempelriddaren (Arn: The Knight Templar). A very decent TV series, recently released on DVD. At the time of this revision, ARN is available on NetFlix. National Treasure. The connection to the Templars is rather marginal, but a pretty good movie. A Medieval Knight resurrects to fulfill his vow and bestow a blood-thirst vengeance upon the kindred spirits of those who betrayed him long ago. In the course of one night, identities will be revealed, destinies met, and a poetic justice of the macabre maniacally served. Sounds like a nice romantic date movie, uh?